Peppermint tea can do more than remedy bad breath. One of the most popular tea flavors across the world, peppermint tea is known for its ability to reduce pain, inflammation, headaches, and sinus pressure. It also helps promote sleep and digestion, making it the perfect tea to sip when you’re having stomach troubles. And now, the kicker: Peppermint leaves contain Vitamin B, Calcium, Potassium, and Magnesium, all of which help your body fight off illness. Sweet, fresh, and perfect for winter, the sneezy season. There are multiple ways to brew and serve peppermint tea – whether you prefer it on the sweet side or super crisp and fresh. You also use this tea to infuse your favorite holiday cocktails Whether you choose to add milk, ice, coffee, or even another loose tea to the mix, we promise peppermint tea won’t disappoint. 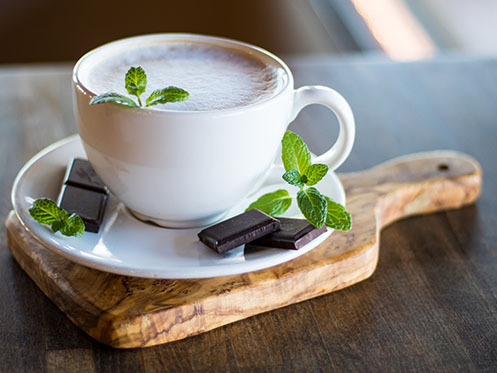 Check out a recipe for Chocolate Mint Tea below. It’s seasonal, and straight up delicious. Take a stroll through Downtown Knoxville on the Peppermint Trail, now through January 6th, and stop by our shop to try our whole leaf peppermint tea. You can also purchase our peppermint tea online by clicking the button below. Steep bag of Jackson Avenue Peppermint Tea in 6 ounces of hot water for 5 minutes. Add 1 teaspoon cocoa powder and 3 teaspoons honey. Stir.